Now that the old chestnut is in the varnishing stages, I have to have other projects going while the varnish dries. 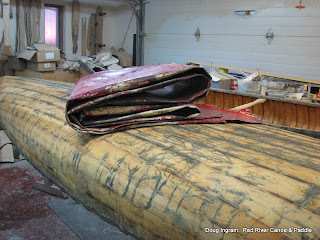 so, I brought in the next old Chestnut canoe. This one only dates from the '70's. Still, that's at least 30 years old. The wood is still in pretty good condition, as is the interior varnish. Not great, but all it requires is a sanding and one or two top coats. In order to save some money, the owner will be doing that, as well as the trim, and painting the outside. That's the old canvas folded up and sitting on top. Posted by Doug Ingram at 10:09 a.m.